so, i’ve been quite the slacker when it comes to this blog! i can’t believe my last post was in july of last year. actually, i can once i consider that july of last year is when i began the process of becoming a homeowner! a lot of things went on the backburner while we navigated the process of showings, offers, counteroffers, home inspections, and the like. i closed on a house in october and i’ve had lots of projects to keep me busy! one of the main selling points of the house was the gigantic yard – it’s a double lot on a corner – because i have been wanting a vegetable garden for years! well, this year, it’s happening. since i live in the frozen tundra of northern wisconsin, i need to get a little head start on the growing season so i am starting seeds inside. 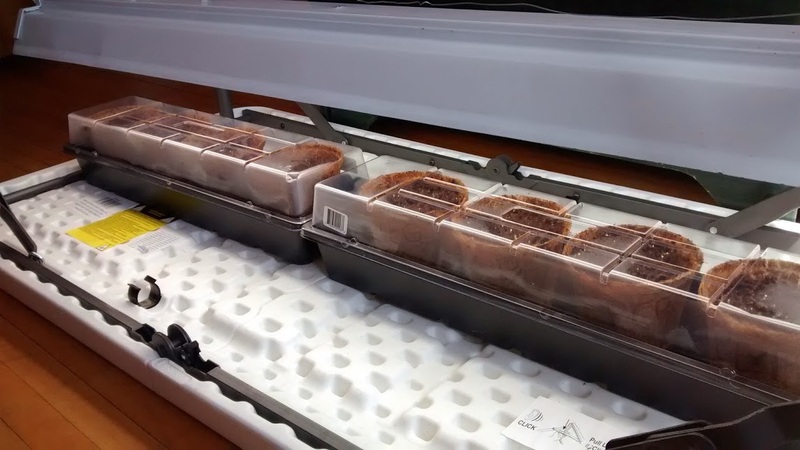 today i planted tomatoes, green peppers and red peppers and put them under my handy grow light setup. not the most sophisticated thing in the world, but it works! i’ve got a folding table upside down with the light hanging from the table legs. it’s in the guest room, which gets the least traffic in the house, and being on the table means i can slide the whole operation around when needed. i’ll be adding some more things at a later date but these are what need to get started first. i’m a little concerned about the temperature – i have not invested in any warming mats or anything to provide heat underneath so hopefully the light is enough. normally we keep the door closed, but we’ll keep it open now so the room stays a little warmer. i do see some condensation forming tonight, so that’s a good sign! p.s. one of the home projects is visible in these photos. the entire house was carpeted when we got it – ripped it up in the guest room and office and revealed this beautiful hardwood floor underneath! 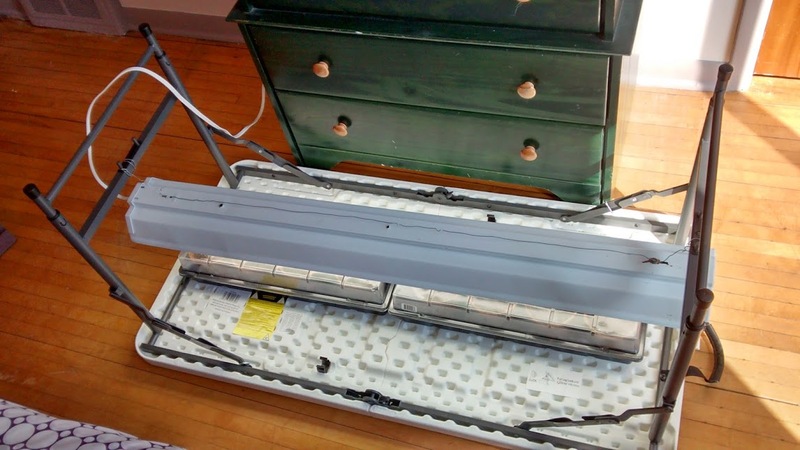 This entry was posted in Gardening and tagged garden, grow light, seedlings, vegetables. Bookmark the permalink.